After giving you the rundown of the rest of the league’s goal masks, I give you the best of the best. These are masks with varying levels of detail and uniqueness. Each of these stand out to me for a different reason and rank amongst my favorite in the entire league. Share your thoughts on who has the league’s best mask in the comments. 10. Ryan Miller – Miller’s mask was getting stale until he updated last season. Adding the Buffalo script to the chin and the charging Buffalo to either side of the chin updated what is becoming a very iconic design. 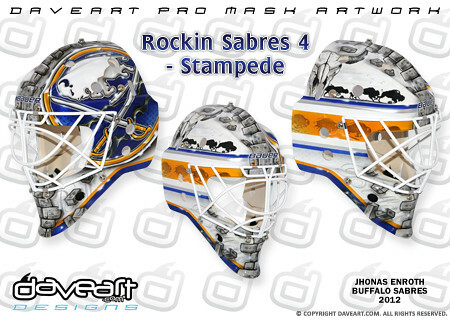 The question is, will you see this design in Buffalo next season? 9. Jhonas Enroth – His crease partner is just one spot below and I give Enroth the edge because of the clean lines and incorporation of a number of design features by his mask artist. Parts of this can get busy, but the longhorn skull has been a mainstay on many old Sabres helmets and the oversized logo gives the left side a clean, basic look. 8. Jimmy Howard – Racing stripes, 60s-era Mustangs and a very unique take on Detroit’s muscle car heritage give Howard a very cool design. 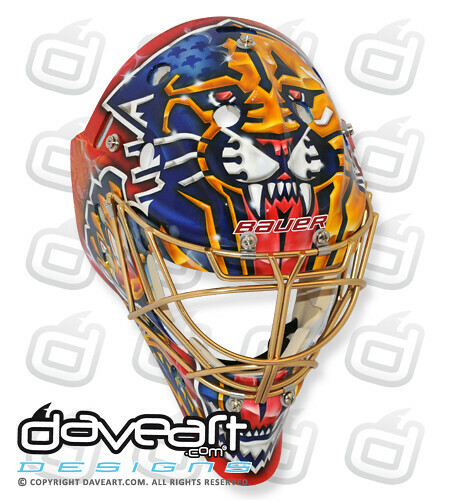 I’m a big fan of this mask and the player who sports it. 7. 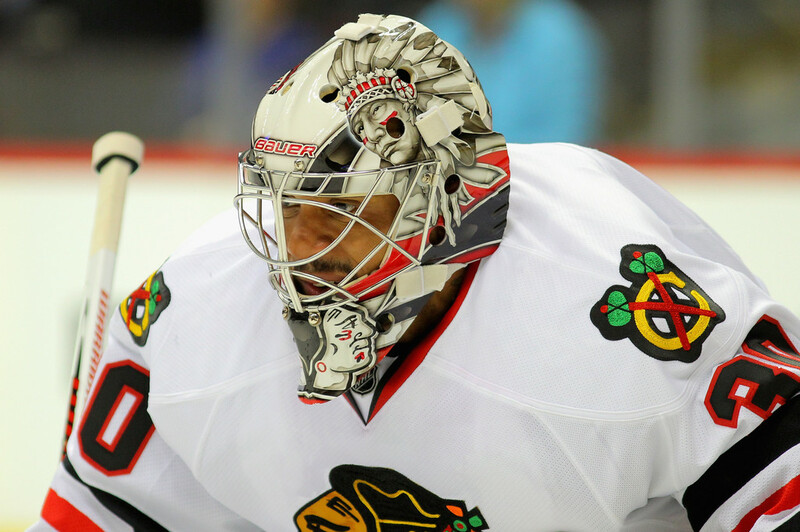 Ray Emery – Emery’s mask manages to pay homage to Native American culture in a very classy way. I think his mask looks phenomenal and is easily interpreted at a distance and up close. 6. Miikka Kiprusoff – Kipper’s skulls are just about as iconic as Marty Broduer’s mask in many ways. This particular version really stood out to me when he unveiled it and I’m glad he’s still using it. I can find no flaws in the design and using the bolts as eyes on the chin skull is a great touch. 5. Jose Theodore – Theodore has always had masks that I’ve liked. For some reason this one is very appealing to me. I like the Tiki skull features that have been worked in and the white base makes the other colors pop. I think this plays so well on so many levels. 4. 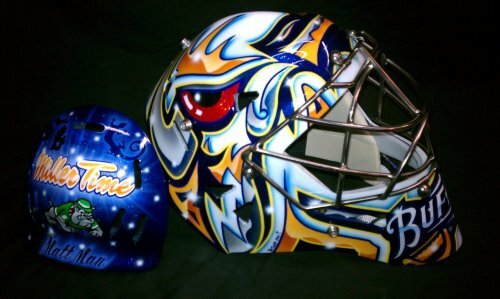 Jacob Markstrom – A slightly altered interpretation of one of hockey’s greatest goal masks of all time. Markstrom’s mask has a little more of the entire logo worked in, but it still has the same feel that Beezer’s mask did back it the 90s. A very well executed paint job. 3. 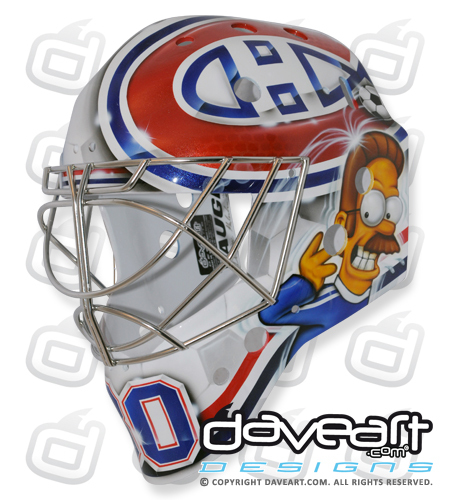 Peter Budaj – Ned Flanders. Need I say more? Budaj manages to work in two very personal items (Flanders and Lionel Messi) into his mask while also keeping a clean look. I love the way this paint job works and that’s why it is in my top three. 2. Brian Elliott – Teenage Mutant Ninja Turtles were a big part of my upbringing and it would appear the same is true of Brian Elliot. I love that he uses Casey Jones on his masks. They also manage to have a heavy team element too, which puts this high on my list. 1. 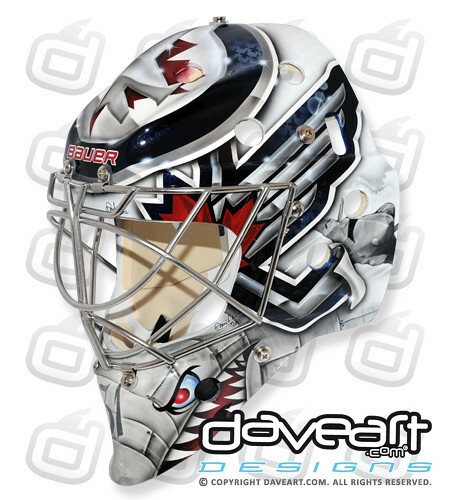 Ondrej Pavelec – When I first did this list I wasn’t sure which mask was truly my favorite. I tossed around a few up near the top of the rankings but I settled on Pavelec for a few reasons. First; the fighter jet interpretation works incredibly well here (much better than Montoya’s). Second; every line is clean and although there is a lot going on, there is nothing that runs together. Third; This just has attitude to it. The fighter jet theme just works so well in this particular paint job and that’s why I have it as number one. As round two begins I’d like to offer my prognosticating skills up to you all once again for the four series that will set the stage for the Conference Finals. After missing only two series in the first round (ignore that I lost both of my Cup predicted teams) I fully expect to go 0-for-4 with my second round predictions. The Penguins sudden issues in goal have made them quite vulnerable. Their six-game triumph over the Islanders only lasted that long thanks to the stumbling play of Marc-Andre Fleury. While Tomas Vokoun provided enough stability to close out the series, he can’t be instill all that much confidence in Penguins fans. Fresh off a pair of grueling six-game series, both of these teams will be fighting some major fatigue in the second round. One interesting thing to watch will be the durability of each team’s top defensemen. Zdeno Chara was run well over 60 minutes over the past two games out of necessity while the Rangers trot Dan Girardi (and Ryan McDonagh) out for a million minutes by choice. The second Original Six showdown of the second round pits a pair of heated rivals against one another. This is a nice treat for hockey purists as the Wings will be heading east next season and severing many of their former divisional rivalries. A nice little regional matchup that pits a perennial playoff disappointment against last year’s Cup champs. The Sharks have flown under the radar this year but have opened plenty of eyes after sweeping the Canucks. While they have plenty of question marks around them, San Jose has two solid scoring lines and have gotten great goaltending from Antti Niemi. Bauer’s impressive line of gear for 2013 is like a good Stanley Cup playoff team, deep. There is elite talent, impressive depth and quality across the lineup. The release of the APX 2 skates has come with plenty of fanfare. The next step in the incredibly popular Vapor line was expected to get plenty of attention but Bauer has two more sets of wheels that should be equally interesting to players. 2013 will see the TotalOne NXG line evolve further along with the introduction of the Nexus skate. Both skate lines offer impressive features that will appeal to a wide range of players. The TotalOne in particular, as Bauer continues to build on a skate line with many equally impressive features to that of the Vapor line. The newest TotalOne doesn’t come stock with the new Lightspeed 3 TUUK, but it does utilize the TUUK LS Fusion blade. That is the same blade that is sported on the Vapor and is 27% lighter than previous Bauer runners. Both the TotalOne and Vapor APX also share the same type of Curv composite upper construction. That, when baked, provide a true custom fit around your foot. This isn’t much difference than previous models in the Supreme line which were built with a strong, rigid boot that molded to a comfortable, custom fit after some time in the skate oven. The key with the Curv composite upper is to eliminate dead space between the heel and ankle area and the boot, thus improving the overall fit. Another addition on the new TotalOne is the flexible tendon guard which combines with Total Edge Comfort to increase range of motion and decrease abrasions and discomfort at the top of the skate. Perhaps the coolest feature on the new TotalOne is the 3Flex Tongue. Bauer, along with Curv, developed composite inserts that will allow players to customize the flex of the tongue on their skates. As Bauer explains, the inserts are supposed to act like spring boards that react as you flex forward in your skating motion. Unfortunately the 3Flex tongue can only be found on the TotalOne model although the Curv Composite upper is featured on the One.9 and the One.8 and One.7 each have thermoformable uppers as well. The skate that I’m most interested in, however is neither the Supreme nor the Vapor but the Nexus line. One the surface it looks like a reincarnation of the legendary Supreme 8000 skates that were the bread and butter for Bauer wearers for the longest time. Bauer rolled out the Nexus this year as the newest line of gear in their collection and it is quickly becoming the most impressive of the bunch from the skates right up through the elbow pads. The upper is constructed differently than that of the Vapor or Supreme. Instead of the more rigid composite construction, the Nexus focuses on weight with a fully stitched “tech mesh” quarter package build. I looks just about identical to the durable nylon stitched quarter package builds from the pre-Vapor days and just in terms of a mirror test, really hits home for me. The Nexus also uses a traditional (in look) retro tan liner. Again, one of those features that ranks high for me in look and set up. The liner itself is hydrophobic. So it is afraid of moisture. This is a great addition as Bauer’s hydrophobic technology is designed to repel moisture and keep your feet, and the skate, dry. Add in a super thick, traditional felt tongue (perfect for sniper tongues) and Bauer managed to build a very traditional looking skate. When you consider the new features they built into the skate – particularly the unique Deep-V heel fit and this is quite the advanced skate. From the 800 on down, the Nexus line is quite consistent as well; which means you’re getting more bang for your buck depending on your target price point. What’s tough about the equipment that Bauer is producing is which line you want to choose. Each one offers so many awesome features and hit on various price points that virtually every player has the ability to use the various advances in the gear tech. Whether you find one specific line to fit your game or if you like each one, be sure to take a look at the Vapor, Nexus and Supreme gear lines the next time you’re heading out to shop.